The Turan was an indigenous Hungarian 20-ton “heavy” tank though by 1942 it would best fit a medium tank category. The Hungarians initially produced the Turan I armed with a 40-mm high velocity gun. When the 40-mm gun was found inadequate against Soviet tanks the Turan II was developed with a new larger turret mounting a 75-mm medium velocity gun. The suspension was derived from the Czech T-35 (PzKpfw 35(t)) tank. 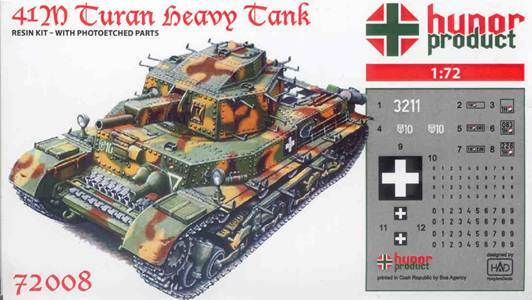 The box art shows an accurate painting of a Turan II tank. The first thing I notice is the immense number of rivets used for production, rather than welding that most all major powers were using at this time. This box art will be important for assembly and as a painting guide. We have a large turret armed with a 75-mm main gun, a coaxial machine gun on the right (our left) of the 75-mm gun, and a raised cupola-like part in the center with a commander’s hatch. There are side doors similar to that on the Panzer IV turret. Hooks hang off the turret and hull side for side skirts, similar to that of the German Pz IV tank Schurzen. There are spare track links mounted on the bow. On the hull is what looks to me like a wooden jack base on each front mudguard; behind these are two headlights. On the rear sides I see handtools. There is a hull machine gun in a bulbous mount on the tank’s left. The hull has one hatch over the driver’s station on the right side (our left). The tank is painted in a striking 3-color, soft-edge, camouflage scheme that will definitely be a challenge for many small scale modelers. 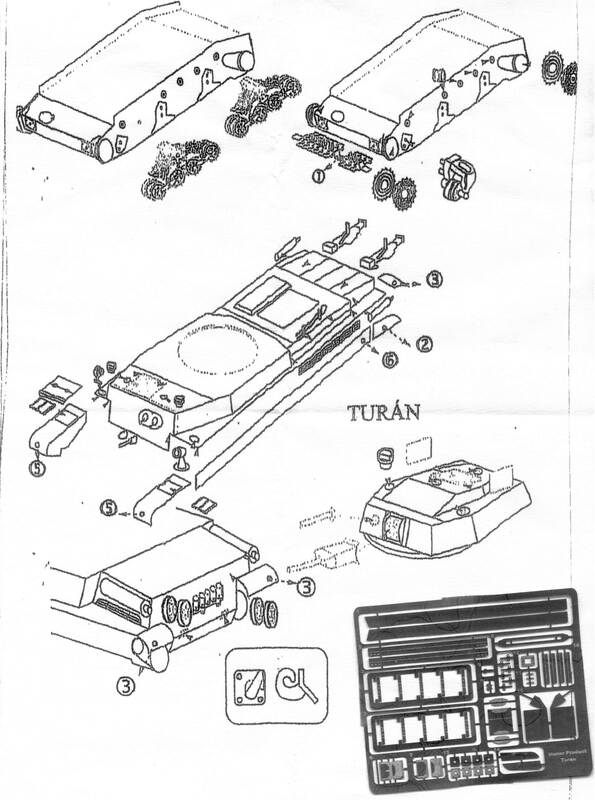 The Turan box art shows Hungarian national markings on the hull sides and engine deck and some vehicle and unit markings on the front plate. At right of the box art is a photo of the kit’s water slide, decal markings for a choice of three or more Turan tanks. Each marking is numbered (but there is no marking guide in the kit instructions). The decals look great and I am very thankful that Hunor has included them! I did not count all the parts but there are approximately 60 light-amber colored, cast resin parts and about 40 etched metal parts, though all the etched parts may not be used with this model. 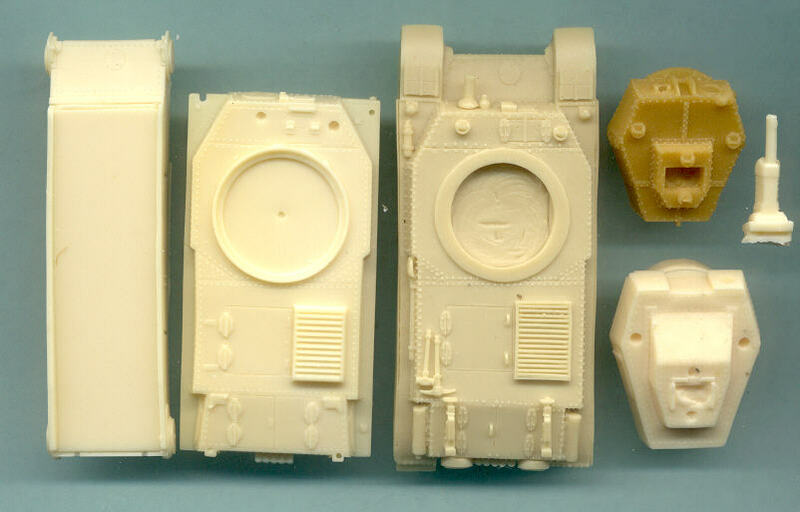 Here we have a scan of the Hunor Products Turan II kit lower hull and superstructure at far left, and the Cromwell Models Combat Ready 1/76-scale Turan I kit hull at center-right for comparison. At far right is the Hunor Products Turan II turret with 75-mm gun; above this is the dark yellow colored Cromwell Models Turan I turret. The Hunor Products casting and detail appears very good. The hull looks rather bare compared to the Cromwell Model as Hunor casts many of their small parts like hand tools, periscopes and jacks separately. At far right we can compare some differences between the Turan I turret from Cromwell Models and the Turan II turret. The Turan 1 mounted a smaller gun and had a smaller turret. Hunor has a depression where the commander hatch should be; in order to mount a figure we will have to drill the hole deeper. An odd thing I notice is that the 1/72-scale Hunor Products Turan hull is the same length and width as the supposedly smaller 1/76-scale Cromwell Models Turan hull. The roadwheels and bogie assemblies for the two kits are about the same size as well. One of these kits has to be the wrong scale! The real Turan is about 5.55 meters long and 2.44 m wide or 77-mm and 34-mm in 1/72 scale, while the kits are about 76-mm long and about 30-mm wide. 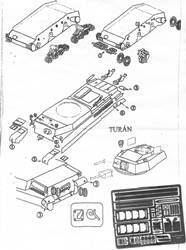 Based on these measurements I would judge that Hunor's and the Cromwell’s Turan tanks are both about 1/72-scale, not 1/76. The lower hull and suspension of the Turan tank are shared with that of Huron Product’s Zrinyi assault gun kits. Hunor Products has an interesting and unique way of casting their tank tracks: as one continuous band with the pour block on the inner edges. Detail and accuracy appear very good. I think that to assemble these we may need to mount them on the attached roadwheels and return rollers and then glue on the sprockets wheels. At bottom left are seven periscopes that insert into holes in the turret and hull roofs. 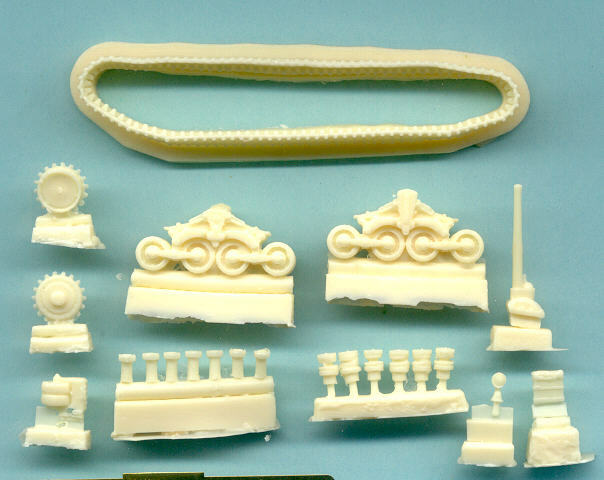 At far right is what looks to be the 40-mm gun for the Turan 1 tank that may be nice with the Cromwell Models kit? I find it interesting that the front sprocket wheels and rear idler wheels are the same; they both have teeth to engage the track. Of course this means the sprocket wheel could be the rear wheel. At bottom right next to the return rollers is a headlight, and a jack block (block of wood that goes under the jack) which is stored on the forward mudguards. These are the same kit instructions and photo-etch metal parts that come with Hunor Product’s Zrinyi kit. The instructions are barely adequate for an experienced modeler in my opinion. The etched metal parts are numbered but I found no numbers on the resin kit parts. It is unclear about several dashed rectangles for the turret. Overall, this is a very nice kit of a unique vehicle and I greatly appreciate Hunor producing several models of it, if it had great assembly directions I would appreciate it even more. Study your reference photos really well and look at some fine large scale Turan models to help with assembly.